I had to write a quick post about this recipe because D. and I just had some for lunch and oh my gosh, it is good! Truly, we were scraping the casserole dish clean. This is adapted and plagiarized from Alanna’s World’s Best Green Bean Casserole, and I have to say, the name fits. I made up a full recipe to bring to Thanksgiving at the in-laws’ tomorrow, but I set aside this small dish to bake today just for us (and to photograph just for you). 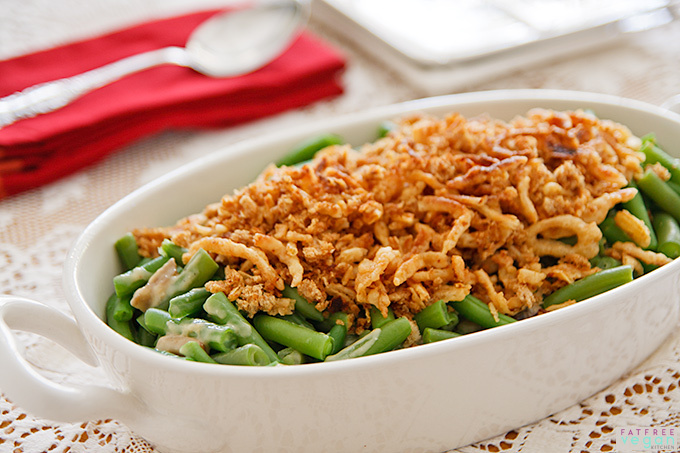 Though I can’t say that either my husband or I were fans of green bean casserole in general, we’re now fans of this one. What can I say? You could try it completely fat-free as outlined in the recipe’s notes, but for a special occasion, this isn’t a huge an amount of fat. And the taste is amazing. No one will know it’s vegan! Twelve years (yikes!) have gone by since I posted this recipe, and since then it has become the recipe most requested by my extended family every Thanksgiving and Christmas. It has become a tradition for us and I hope it becomes one for you. Thanks to Alanna for the recipe, and thanks to all of you readers for your support through all these years I’ve been posting vegan recipes. Your comments and input make blogging fun! You could make this healthier by using caramelized onions instead of fried--just cook them slowly until they begin to brown and then mix them with the bread crumbs. You could also omit the margarine. Beans: Bring the water to boil in a large pot. While it’s heating, cut up the beans. Add the salt and beans to the boiling water. Cover and cook for 6 minutes. Drain beans in a colander, and then spray for a minute with cold water to stop the cooking. Let them drain in the colander, shaking every now and then to get off all the water. Sauce: Trim and discard the mushroom stems and chop the mushrooms into pieces. Spray a non-stick pan with canola oil and heat it. Add the mushrooms, garlic, cayenne, salt, and pepper. Cook until mushrooms are very soft and exude their juices. Whisk the flour into the vegetable broth and add to the mushrooms along with the sherry. Simmer, stirring, until mixture thickens. Add the soy creamer and simmer until thick, about 5 to 10 minutes. Adjust the seasonings and stir in the beans. Topping: Put the bread, margarine, salt, and pepper into a food processor and pulse until crumbly. Pour into a bowl and add the onions. Stir to combine. 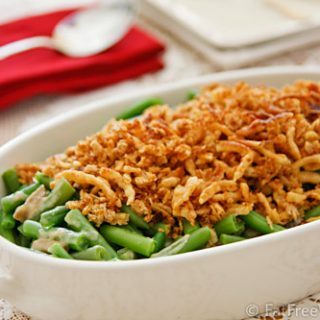 To assemble: Put the green beans into an oiled casserole dish and top with the onion mixture. Bake at 425 F for about 15 minutes. If you are not serving this right away, refrigerate the topping separately; bring to room temperature before sprinkling the topping on the casserole and baking for about 20 minutes or until hot throughout. *Sodium figure is inflated because it includes all the salt in the bean-cooking water, most of which is not actually absorbed by the beans. You can make this even lighter by replacing the topping with pan-"fried" onions (without oil) and panko, seasoned with black pepper. If you’re looking for more holiday recipes, don’t forget to check the Thanksgiving and Holiday sections! I was wondering if this would work if I blended the mushrooms into the sauce. My kids hate the texture of mushrooms and I’m not too fond of them either. My mom made them a stroganoff dish and blended it to hide the mushrooms and they loved it, so I’m thinking this might work. What do you think? I think that would be fine. Please let me know how it comes out! This looks great! For anyone that is gluten free this season as well, just replace the flour in the mushroom sauce with 1 TBS GF cornstarch, and for the topping sprinkle on toasted thin sliced almonds or toasted gluten free bread crumbles. I’ve even seen some recipes around for gluten free onion rings you make in the dehydrator- They would be WONDERFUL as well!! Your recipe makes it very easy to alter to GF. Thank you so much! Just the tip I was looking for! Thank you so much! And I like the idea of toasted almonds better than GF bread crumbs. I want to make this for Thanksgiving but I need to double it… what size casserole dish should I use? Love your recipes! Thanks! I think you could fit it into a 9×13 pan if you double it. If you don’t have that size, look for one that holds at least 3 quarts. 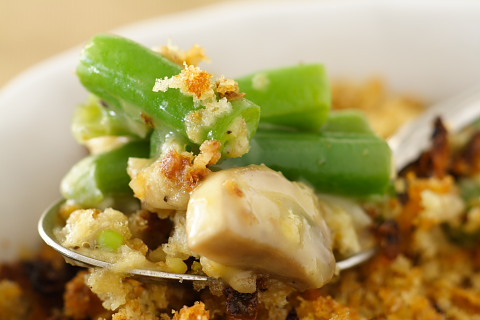 You can check the size by putting the uncooked green beans into it and seeing if there is enough room to allow for the mushrooms, sauce, and topping. I would love to hear how they react! Happy Thanksgiving! 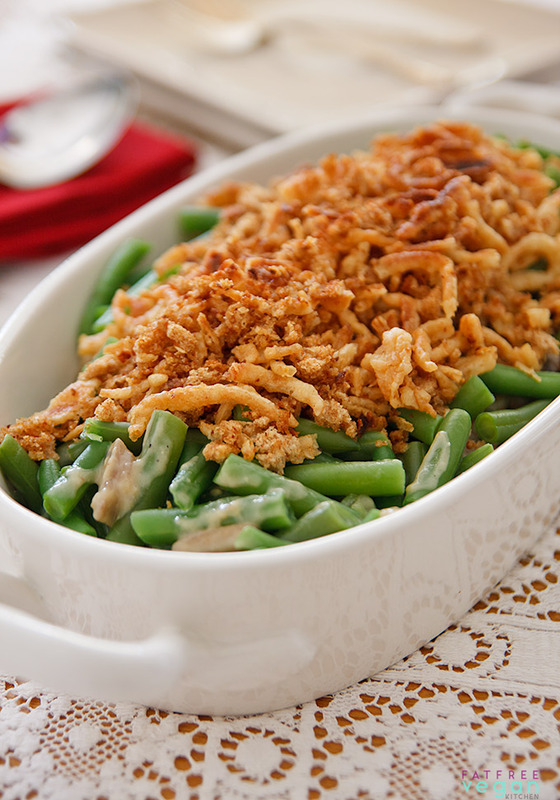 I was getting ready to go to the store today to buy things for my portion of the thanksgiving meal and needed a recipe for green bean casserole, and immediately came on here to see if you had something I could make….and this is absolutely delicious. It will sit happily next to the double layer pumpkin cheesecake- which I have been making for the past three years! I just tried this recipe for Thanksgiving. My husband is vegan and I’m vegetarian, so I wanted to prepare food that we can both enjoy. This recipe was absolutely delicious. The sherry was a wonderful addition … I also think the same amount of white wine might work well too. Thanks so much for this recipe! A winner once again!! Words do not express my love for this recipe. Sometimes I make it just because green beans are in season. And hilarious!! This morning, my husband (who is sick and also lactose intolerant) said to me, “I probably should stay way from the leftover casseroles since they have so much dairy.” And I’m all “Uh, they’re vegan.” LOL! I love it when he can’t even tell. just wanted to let you know that I made this WONDERFUL green bean dish for my non-vegan dad (who is from the south) on Thanksgiving. He went on and on about how good it was (the sherry? the cayenne pepper? I don’t know what “made” this dish so great)…he also told me about four times that the last time he had this was years ago at so-and-so’s house. Thanks so much – – it was fast and easy and I don’t think that he even knows that it was vegan!!! Delicious!!! I made this for myself and my husband (vegan) and some non vegans. Raving reviews from both!! My husband has even loved eating the leftovers! We havent been vegan very long and your site really has helped a lot. Thank you so much!!!! So delicious! It’s so good, there weren’t enough left overs after Thanksgiving, so I have another batch in the oven right now to go with the food that did make it to leftovers! I made my first fully vegan Thanksgiving dinner this year – this was one of the recipes I used and I have to tell you that this was WONDERFUL! We loved it! Thanks Susan! I’m wondering if there’s any tips for preparing ahead of time. We have a tight and busy Christmas schedule, could I make this two nights before and freeze it, and then back it that day?! Sara, I definitely wouldn’t freeze it, but you could make it two or even three days ahead of time, and it will keep unbaked just fine in the refrigerator. I keep the topping separate and then add it just before baking. Thank you so much for your reply!! I wasn’t expecting to get an answer, this is so very helpful! While I am a frequent visitor of vegan blogs, I always try recipes yet forget to give a review on the blog that I got the recipe from. So needless to say, this is my first review of a recipe that I have tried and fallen in love with. My boyfriend and I are both vegan and when we found out that we would be visiting my non-vegan family for Thanksgiving, we knew that we had to plan ahead so that we would have something to eat. I had to do better than last year’s Tofurkey because it seemed to make me stand out even more with its unappetizing appearance. I made vegan cornbread, bought the Quorn turkey roast (Yes, I know it’s not vegan but it was my only exception so that maybe other people might be inclined to try it too! Don’t tell the vegan police! ), made your green bean casserole and your pumpkin cheesecake. Oh my gawd. My dad, who is such a sport when it comes to vegan foods, willing to try anything with an open mind, even agreed that this was the best green bean casserole he had ever had in his life. And it truly was. Tasted EXACTLY like the Campbells soup recipe one but way more flavorful with the addition of Shitake mushrooms and Sherry. I was so pleased with the results. I feel like every family should use this recipe instead of the campbells soup recipe. The only thing i didn’t like was that some of my family friends were hesitant to try it even though it was the exact same thing!!! Once they did try it they were extremely pleased. In addition the cheesecake was incredible. I am lactose intolerant so i haven’t been able to have cheesecake in a long time (Without taking Lactaid pills before being vegan). This doesn’t mean that I haven’t forgotten what cheesecake tastes like. Your pumpkin cheesecake recipe tastes EXACTLY like the real deal! Let’s just say that we were extremely thankful for your Thanksgiving recipes! i used this recipe for some people i cook for. she is off dairy for now so wanted to find a nice vegan recipe to use green beans. i didnt use soy creamer to replace cream but instead found a product called “Mimiccreme”. its made from cashew and almonds. in an aseptic container. anyway, she LOVED it!!!! Hi Susan – I know we’re a long way from the time for Thanksgiving, but I wanted to make the casserole for a potluck here in Scotland, and wondered if is it possible to make ahead and freeze it? Many thanks, Norma. I think it will freeze fine. Hope you enjoy it! At the end when you say top with the onion mixture, do you mean the mushroom mixture? I want to try this this Thanksgiving. No, the mushrooms are mixed with the beans. You top that with the onion topping. Hi Susan. I made this last year for Thanksgiving and it turned out wonderful. I just can’t seem to remember whether I should toast the bread before blending it with the Earth Balance or just use freshly sliced bread. Any help would be appreciated! Alexis, I don’t toast the bread. Hope you enjoy it again this year! Love this recipe. I’ve used it ,adding a few personal touches, for the past 3 years. Love how fresh and wholesome this tastes compared to the salty, fatty, processed “traditional” casserole. My carniverous Family embraced this delicious vegan side dish as our new tradition without even a thought of going back. I’d like to make this recipe for Thanksgiving but I don’t keep margarine in the house as a rule and don’t want to buy it for just one dish- do you think subbing the EB for olive oil in the topping would work ok? Thanks! Love all your recipes, Susan. I’m pretty sure that would work just fine. Hope you enjoy it! Refined coconut oil is a really good sub for margarine. I’d like to make my own onion rings to top this off. Do u think panko crusted onion rings crumbled on top would be a good sub? Would u still add bread crumbs and butter? Also, just read the comment about NOT freezing it. So noted – into the fridge it goes…. This is beyond delicious! I used a round glass dish but I would definitely recommend using a 13 X 9 that way it is all evenly distributed. Everyone loved and I was the only vegan!